Don't miss the double header on December 10th, an opportunity to play two of my games! First, swing by the arcade at the NYU Game Center in Brooklyn to try the massively local multiplayer title, Pixel Prison Blues! Feel free to choreography your own victory dance. We expect over 700 attendees, so after a few hours of navigating the crowd, you'll probably need a drink. Join me at Solas Bar in the East Village, where you can sate your thirst and check out my secret project. 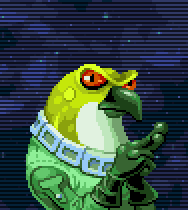 The Frogbird strongly recommends you buy me a drink. For the last several months, I experimented with variations on the above piece, which started as a menu screen for a project. When the game was abandoned, I repurposed the screen to be a stand-alone piece. For my future personal work, I plan to transition to a style that's less overworked. Ideally, I settle on something with the appearance of effortless mastery, although from my experience with art, this new approach will likely be more time consuming than the current one. Typically, my pixel art doesn't start and end with a single PSD. 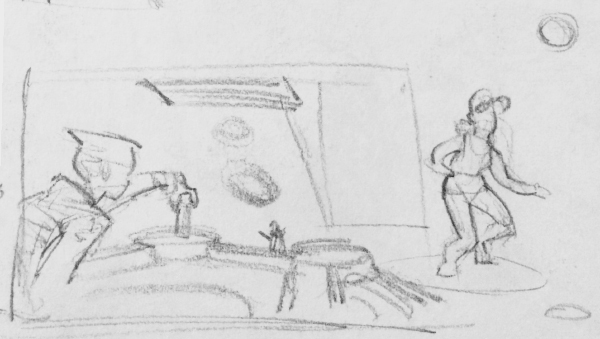 Instead, I undertake a series of pencil sketches to explore shapes and compositions. Please ignore what appears to be a beach volleyball player on the right. She's just doing her own thing, and had little influence on the final piece. 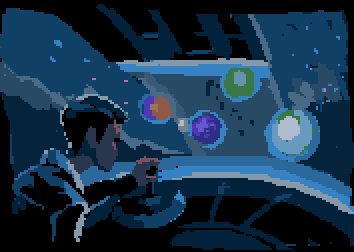 Once I zero in on a sketch I like, I recreate it digitally, blocking out the colors to establish the mood. 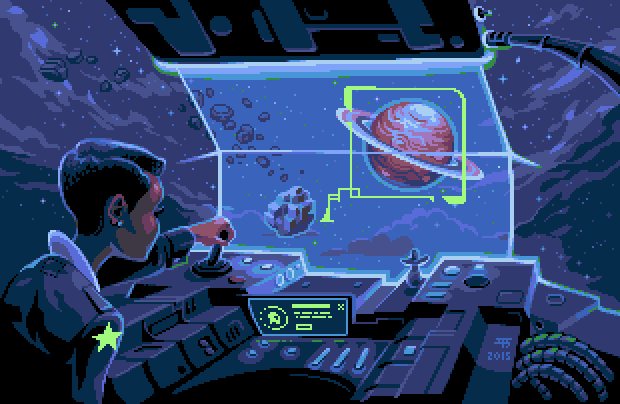 This pixel sketch can serve as the foundation I work on top of to achieve the final piece, but mostly it's a side-by-side reference so all the energy doesn't die once I throw perspective lines over the WIP. Keep watching this space! I have a number of exciting developments I will be able to share soon.